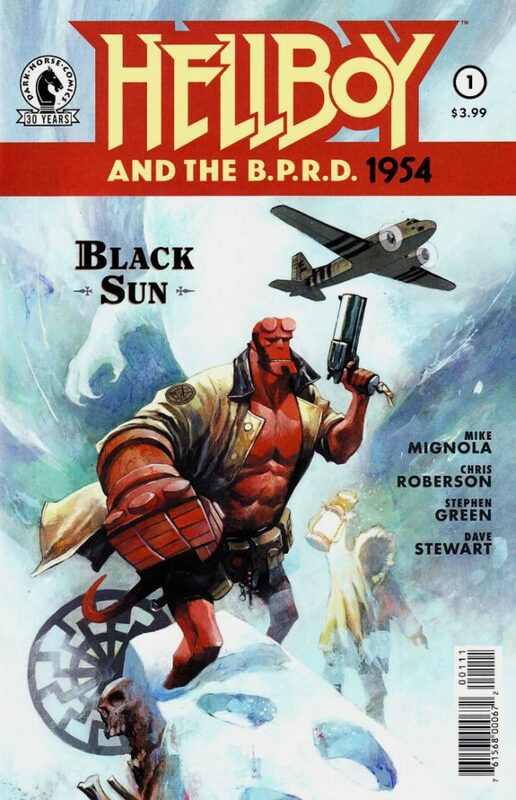 It’s always a good thing when the New Comic Book Day releases include Mignola and his merry group of collaborators bringing us fresh Hellboy stories. 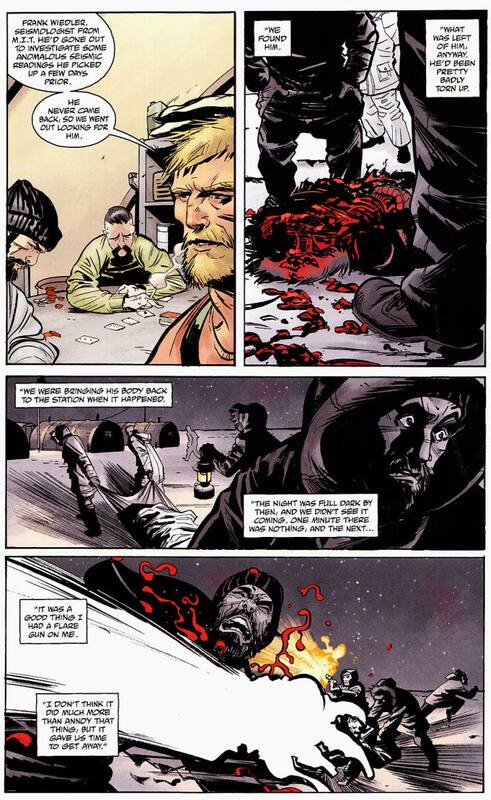 Although the main Hellboy narrative arc has finally finished with the Hellboy in Hell series, over the last couple of years we’ve been treated to these “young Hellboy” stories, starting with Hellboy and the BPRD 1952, which filled in some back history and gave us a view of Big Red’s very first time out as a field agent (1952 reviewed here, and you can read the 1953 review here). This week the latest mini-series kicked off with the 1954 installment, and, rather appropriately given the era it is set in Mignola et al have happily – gleefully, I am sure – raided some of the science fiction of the period, notably the 1951 classic film The Thing From Another World, adapted from Campbell’s Who Goes There novella and decades later the inspiration for Carpenter’s iconic The Thing. There’s a good bit more going on here, including some revelations a good bit later into this first issue, but there’s no way to talk about those without also blowing some (very cool and fun) plot points to anyone who hasn’t had a chance to pick this up yet, so much as I enjoyed those elements I will restrain myself. 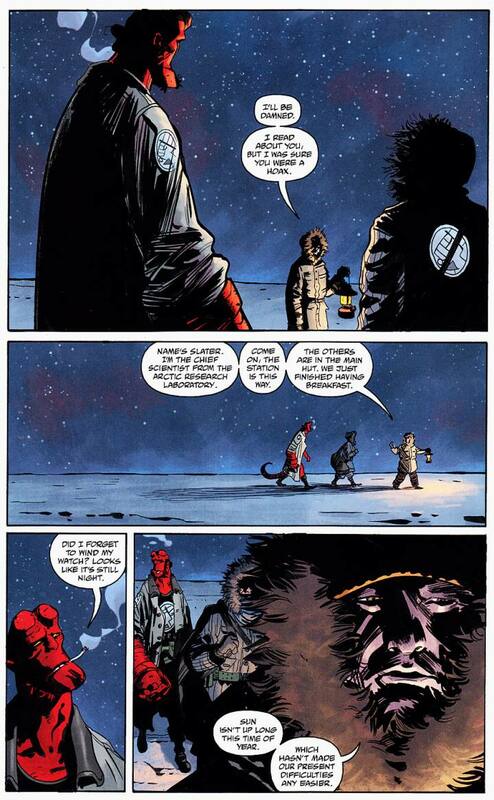 The approach and setting here, homaging those older sci-fi/horror tales is a geek pleasure – I’d guess most of us who love Hellboy would also love those tales, so seeing something in that period vein but starring HB is going to make us smile. Farrier is all wonder and excitement – an academic, he doesn’t get out into the field too much and he is so excited at the thought of a possible unknown species that he’s almost like a kid, oblivious to the danger, while Hellboy, for all he’s only been a field agent for a couple of years by this point, is already experienced and a bit more jaded (probably just a mutation, he tells the over-excited Farrier). 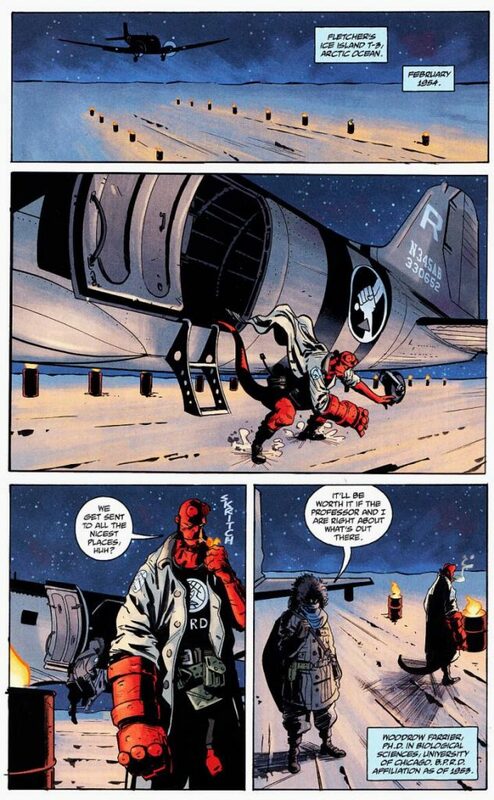 And there are later elements which nod both to more sci-fi of the era and also to some old Hellboy opponents too, but again I will keep my big mouth shut on those for fear of spoilers. 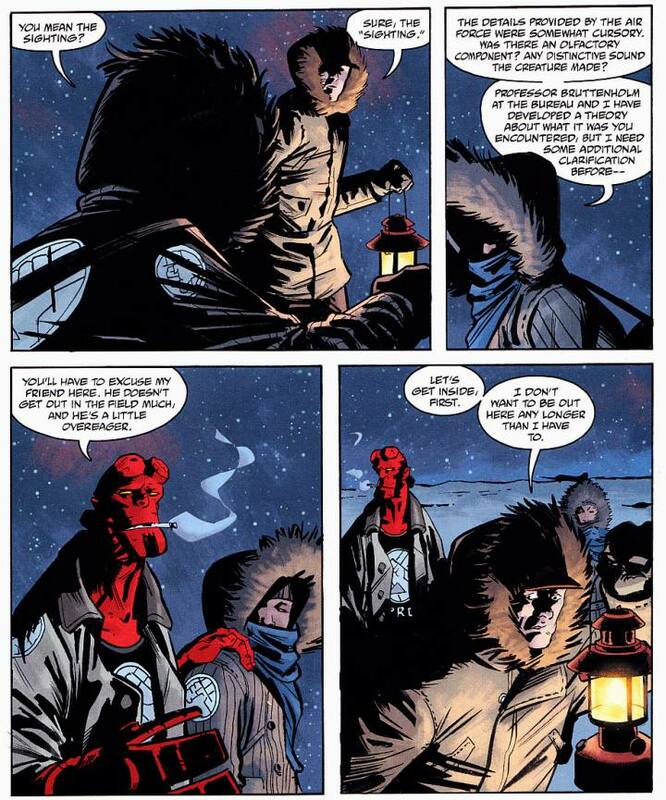 It’s never easy for any artist to approach Hellboy – Mignola’s visuals over the first couple of decades of the character’s life are pretty much iconic in style and palette, and it cannot be easy for any other artist to come in and draw the character in their own way but also maintain a visual cohesion to the years of previous art. Green, however, pulls it off nicely, right from the opening of the Dakota rumbling into a frozen airstrip and Hellboy jumping casually out and lighting up, to the bursts of action and then (well, then those other parts that I am not going to mention for fear of ruining the surprise). This is an absolute pleasure, especially for those of us with a love for some of those old pulp sci-fi tales and films of that era, and it seems clear to me the creators are also having fun, and that always comes across to the reader.